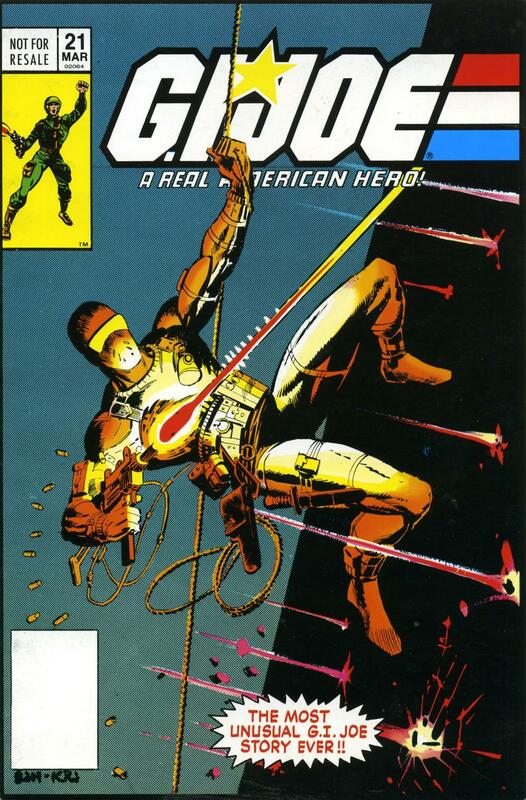 I wasn’t a regular follower of the Joe comics back in the day, but I think this is also where they started to make the connection between the Snake Eyes and Stormshadow’s pasts? You are correct. It’s that final page where you see they both have the same tattoo on their arms that begins exploring the link between Snake Eyes and Stormshadow. Issues #26-27 delved into their mysterious past. That compelling tale from 1984 was the only time G.I. Joe really grabbed our attention. This was amazing! The talent it took to convey a story with no words in 1984 is hard to overestimate. Hama was a genius and never given appropriate credit for the groundbreaking work he did with gi joe – probably because it was a toy-based comic. But for those who actually read it, it was actually more complex than anything else I ever read in comics. Glad to see with the Internet that Hama is starting to get some appreciation for this amazing issue! We’ve been meaning to scan that one, and also Hama’s origin of Snake-Eyes from #26-27. Probably my all time favorite single issue of a comic book. I would agree in calling this the best GI Joe comic ever. And I would add that the issues with the Snake Eyes origin printed shortly after this were pretty awesome, too.